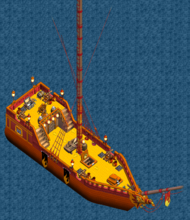 The Inferno class sloop is a limited edition ship available from the shipyards in June 2010. The design and layout is quite a bit different from a normal sloop. It has a raised deck at the back of the ship. 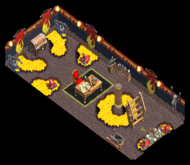 Inferno class ships have one of the following adjectives in their names: Blazing, Burning, Combustible, Flaming, Frying, Glowing, Heated, Igneous, Ignited, Roasting, Scalding, Scorching, Searing, Sizzling, Smoldering, or Volcanic. 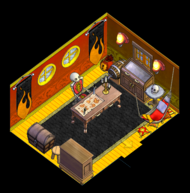 An Inferno class sloop has four scenes: the cabin, the main deck, the main hold, and the crow's nest. The ship comes pre-painted in orange railings, with a red sideboard and persimmon hull. 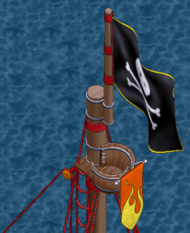 The total paint required to recolor the sloop is 196 units. This scene has no special items. This page was last modified on 17 February 2017, at 22:52.